HARDWOOD FLOORS ARE AN INVESTMENT THAT WILL LAST FOR A LONG TIME WITH THE PROPER INSTALLATION AND CARE. STAIRS.RISERS, SOLID WOOD STRIPS, PARQUET, LAMMINATE. WIHT ALL MODES OF INSTALLATION MOISTURE TESTING IS IMPERATIVE TO ENSURE PROPER INSTALLATION CAN BE A PAINST A KING PROCESS BUT WE TAKE PRIDE IN LEAVING YOUR HOME LOOKING AS BEAUTIFUL AS WE FOUND IT. 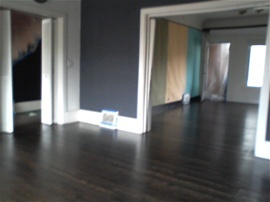 WE HAVE SEEN EVERY SITUATION AND ARE PROFICIENT IN THE THREE DEFFERENT TYPES OF INSTALLATION FOR HARDWOOD FLOORING. IN THIS METHOD WE NAIL DOWN OR STAPLE SOLID OR ENGINEERED WOOD STRIPS TO THE SUBFLOORING ( PLAYWOOD OR PLANK WOOD). THE FLOOR IS DONE WITH RANDOM LENGTH STRIPS. A FEW STRIPS ARE PLACED DOWN AND ARRANGED PRIOR TO FASTENING TO ENSURE PROPER PLACEMENT AND TAUTNESS. IN THIS METHOD WE GLUE DOWN ENGENEERED WOOD STRIPS OR PARQUET DIRECTLY TO THE SUBFLOOR. IN THESE CASES THE SUBFLOOR IS USUALITY CONCRETE SO WE PAY EXTRA ATTENTION TO MOISTURE. IN THIS METHOD WE GLUE TOGETHER THE TONGUE AND GROOVE OF EVERY PLANK AND THE FLOOR FLOATS OVER A FOAM CUSHIONED PADDING IF THE FLOORING HAS A LOCKING SISTEM WE CAN LOCK THE PIECES TOGETHER WITHOUT GLUE. THIS CAN BE USED WITH EITHER LAMINATE OR ENGINEREED WOOD FLOOR.